In 2017 the live birth rate of the United Kingdom fell to 11.4 births per 1,000 population, the lowest it had been since 2002. From 2010 onwards the birth rate in the United Kingdom declined steadily, after reaching a sixteen-year high of 12.9. 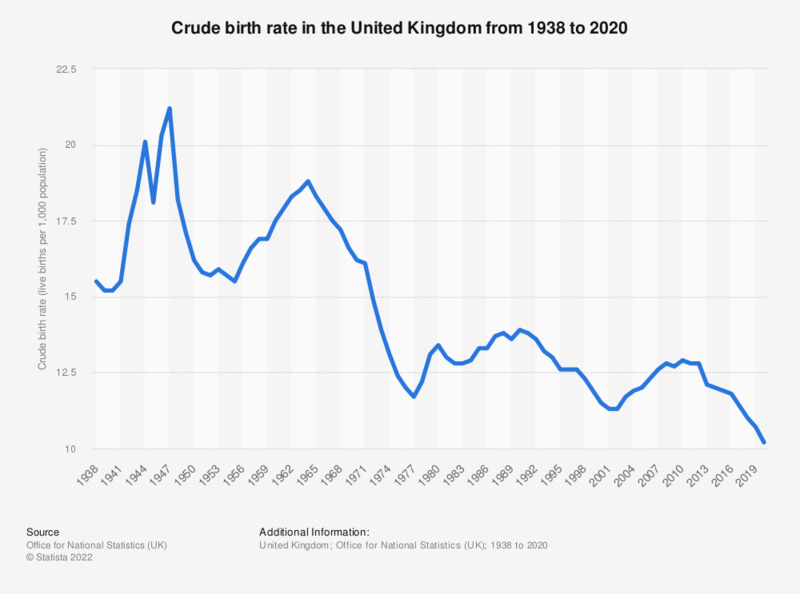 The crude live birth rate for this statistic is based on the 755 thousand births that occurred in 2017, and the mid-year population estimate of 66 million for the United Kingdom. It has a close relation to the fertility rate which estimates the average amount of children women are expected to have in their lifetime, which was 1.74 in this reporting year. Although the live birth rate of the United Kingdom has declined in recent years, it is still higher than that of similar sized European countries such as Germany, which had a birth rate of 9.6 in 2016. France too has a lower birth rate of 11.2 but has followed a similar trend of falling birth rates to the United Kingdom. Everything On "Demographics of the UK" in One Document: Edited and Divided into Handy Chapters. Including Detailed References.